Coryell County commissioners in Texas have approved a package of incentives designed to encourage SpaceX to expand its footprint. The agreement would provide incentives to stimulate, encourage and develop business location and commercial activity in Coryell County in return for which SpaceX would have to maintain a payroll of about $2 million for employees who live in the county. SpaceX hasn’t publicly announced any plans to expand beyond the more than 4,000 acres it now leases from the City of McGregor, but if the private space exploration company were to expand across the McLennan County line, Oglesby is the community closest to the rocket motor testing facility. From where I sit, it’s hard to see what the upside would be for SpaceX in expanding its McGregor facility across a county line. The existing facility has been more than adequate to support both Falcon ops and Raptor development. Even the development and testing of some future much larger incarnation of Raptor for some future BFR successor could probably be accommodated within the existing footprint. The test of a single engine of up to 2 millions lbf thrust wouldn’t produce any more noise than existing all-up tests of Falcon 9 1st stages so even the NIMBY factor would be roughly constant. But I, of course, do not sit in Elon Musk’s chair. If Mr. M sees any advantage in taking this offer, he can be counted upon to do so – or to negotiate an even more advantageous deal. Perhaps the two county gov’ts. can be pitted against one another anent hosting future noisy activities. But one presumes that the local politicos in the Boca Chica area might also want to get their bids in as well. They are throwing incentives to entice SpaceX to stay. Think the McGregor politicos are afraid that SpaceX might leave after Dragon 2, Falcon 9 and Falcon Heavy retires in flavor of the BFR. 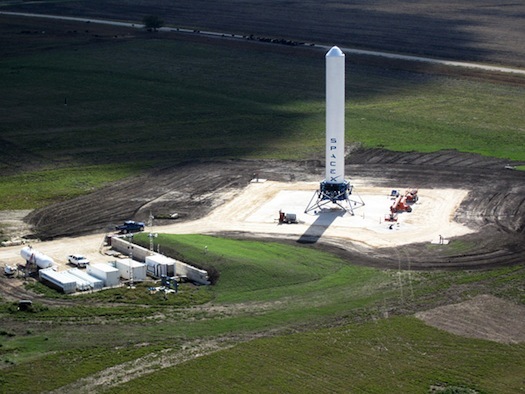 Because if you think about it if SpaceX just have to only test fire Raptors it would be logical to located the test site close to the launch site, not the middle of Texas. That occurred to me too. If SpaceX wants to test BFB stages all-up and full-duration as it currently does F9 and FH cores, McGregor is pretty much a non-starter for logistical and NIMBY reasons. The logical place to do that sort of thing – assuming SpaceX sees it as necessary – would be Boca Chica. Such a test would be nearly as good a tourist draw for the city fathers of South Padre Island as an actual launch. I doubt SpaceX would raze McGregor in the event it becomes redundant, though. As SpaceX originally bought the McGregor site from a failed would-be launch provider, it could quite likely peddle it as-will-be to another up-and-coming launch provider. Local employment would likely take a big hit in that case, but not all the way down to zero. The Raptors are likely to be build in Hawthorne, and can be easily trucked anywhere in the country for individual engine testing. The advantage of having a test stand at the launch site applies only to the integrated booster tests. Right now, SpaceX builds Merlins in Hawthorne, ships them to McGregor for individual testing, ships them back to Hawthorne, installs them in a booster, ships the booster+engines assembly back to McGregor for integrated testing, then ships it on to the launch site (either Vandy or the Cape). The cost of trucking an engine across the country is very low. They can probably fit a dozen of them in a semi trailer, and send all of them to Texas for a few thousand dollars. Was thinking of downgrading the McGregor facility along with it’s infrastructure and consolidated Raptor engine testing around the the launch sites. Also the Raptor engines likely to be installed not at Hawthorne. More likely at launch site vehicle integration facilities, especially if global P2P service is ongoing concern. You have to be able to installed or replaced engines at any launch site routinely. Also the BFS and BFB are only transportable by sea. Trucking engines cross-country costs time rather than money. SpaceX can install Merlins at the launch site, and can even swap them out while rolled out on the launch pad. They just prefer to install them in the factory initially. Any BFR launch site is likely to have a refurbishment and repair facility nearby, with extra engines on hand to swap in a hurry if needed.